Please call 1-800 BROADWAY x2 to inquire about availability and pricing. There's no better place to be this holiday than Christmas Spectacular! 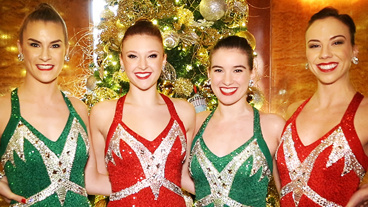 Make time for joy this season at the Christmas Spectacular Starring the Radio City Rockettes presented by Chase. Get your tickets today and choose a date that fits into your holiday schedule. There is no better place than Radio City Music Hall to share joy, laughter, and lasting memories as you take in the legendary precision and grace of the Rockettes. The Christmas Spectacular is sure to become an unforgettable part of your Christmas tradition. 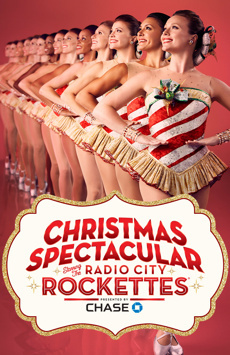 What Is The Christmas Spectacular Starring the Radio City Rockettes Like? There’s more great precision dancing than ever in the show’s current edition, which was revamped in 2007 and tweaked again this year. Glamorously outfitted in a series of eye-popping costumes, the Rockettes perform on a double-decker bus, a sparkly staircase and a snowy forest and enact a lightning-fast version of “The Twelve Days of Christmas.” Not to worry: They’re still doing the classic “Parade of the Wooden Soldiers” number, too. Each scene is enhanced by video backdrops displayed on one of the world’s largest LED screens. Is The Christmas Spectacular Starring the Radio City Rockettes Good for Kids? Yes! Ideal for audiences of all ages, the Spectacular has become a holiday tradition for generations of families. Morning and afternoon performances allow little ones to enjoy the show when they’re well-rested, and quick-moving scenes of Santa’s workshop, a stuffed animal Nutcracker, and even a 3-D film will keep them riveted. You can’t go wrong with this one.